A BLOOD TEST TELLS YOU WHICH WATER TO DRINK! How much HYDROGEN does your water produce? Our water has 30 times the ENERGY of any other water measured by ELECTROLYSIS using only 20 drops to produce the energy needed to supplement our FOOD and fight world hunger! USE ANY WATER YOU WISH (energized, alkaline, hydrogen, oxygen, DDW, DEW, distilled) AND DISCOVER THE TRUTH!! A Few Things You Don’t Know About Ronald Reagan and Oxygen…. Only a small cabal of Ronald Reagan’s most trusted friends knew his deepest, darkest secret on July 12, 1985. 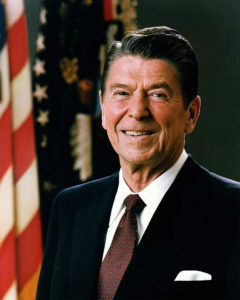 The President of the United States, Reagan—had just been diagnosed with not one, but three, deadly forms for cancer. In a discussion with Vice President George H.W. Bush, the president decided to resign the presidency and surrender the Oval Office to his vice president. Bush was convinced the Democrats would launch a blitzkrieg battle for the White House in 1988—and would likely win. While some of the nation’s best oncologists offered their services to the 40th President, he chose a German physiologist, Dr. Otto Heinrich Warburg who also had a decree in oncology. A half century ago Warburg discovered that cancer generates an adenosine glucose breakdown caused by fermentation respiration. This is in direct contrast to healthy cells, which generate energy from oxidative breakdown of pyruvate. Pyruvate is the end product of glycolysis which is oxidized within the mitochondria. Warburg discovered that one of the primary causes of cancer is mitochondrial dysfunction. dead within a year or so before or after Bush-41 was elected. Reagan went to Germany for a unique treatment and returned to Washington cancer-free. Think about that. Millions of people in the United States who never found John Ellis’ Electron distiller purifiers and also never learned that oxygen not only kills cancer, but AIDS, Ebola, Hansen’s Disease, diabetes and scores of deadly and contagious blood borne viruses and bacteria for which people who go to expensive cancer centers, or hospitals that treat the patients exposed to new viral or bacterial infections using yesterday’s antibiotics and pain killers, or stumbled across a new virus strain or bacteria which was susceptible to oxygen. The American Cancer Society and scores of major medical centers which treat rare and deadly diseases, refrain from using what they refer to as “homemade cancer cures” which kill cancer and other diseases and viruses with non-CDC approved treatment methods like that which saved President Reagan’s life in 1985 in a German hospital in order to cure his cancer and save his life. The excerpt above is from “THE FARADAY TWINS” by an author with 16 million followers. *DISCLAIMER Since I am an Engineer not a Doctor, this information is for educational purposes only. It is not intended to diagnose, treat, cure or prevent disease. Statements contained herein have not been evaluated by the Food & Drug Administration. As in all health situations, as was done in this report, qualified professionals should be consulted.